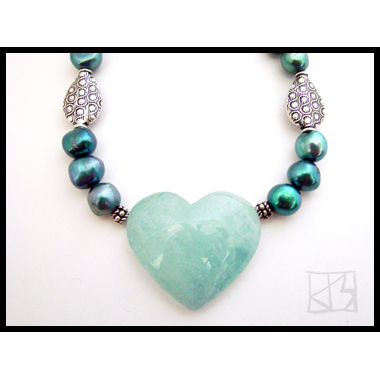 Legend says that aquamarine comes from the treasure chests of mermaids, believed to protect those who travel over water. It is said to bring serenity and insight, reduce stress and quiet the mind, a stone for deep meditation. 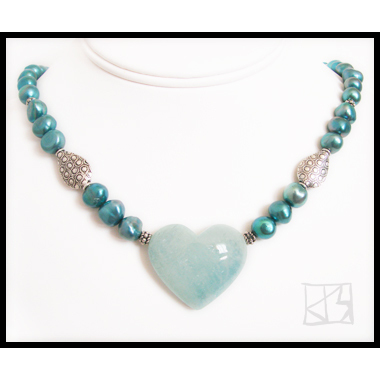 This soft blue domed heart is carved from high-quality Russian aquamarine, cut flat in the back so that it rests comfortably in place. 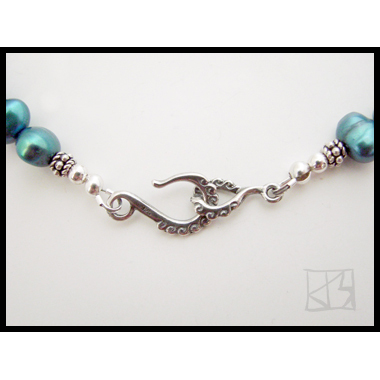 Suspended on beautiful Pacific blue pearls, unique designer sterling accents and Bali silver beads are entrusted to a decorative silver j-hook. I'm known to string and re-string until I see exactly what I want, which is to create a narrative above and beyond adornment. It is my mission and my hope that the 'story' resonates with the wearer. Feminine and bold, romantic yet contemporary... an exceptional piece for an exceptional woman!